Low water levels on Mozambique’s Lago de Cahora Bassa betrayed signs of stress in late July 2016. Southern Africa has been suffering from a prolonged drought, exacerbated by the 2015-2016 El Niño. Roughly 18 million people there urgently need food assistance, leading the United Nations World Food Programme to declare the region its highest-level emergency. 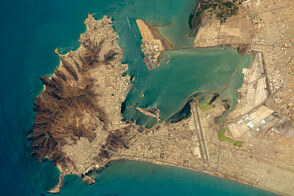 Plunging water levels also threaten the area’s key power source: its hydroelectric dams. 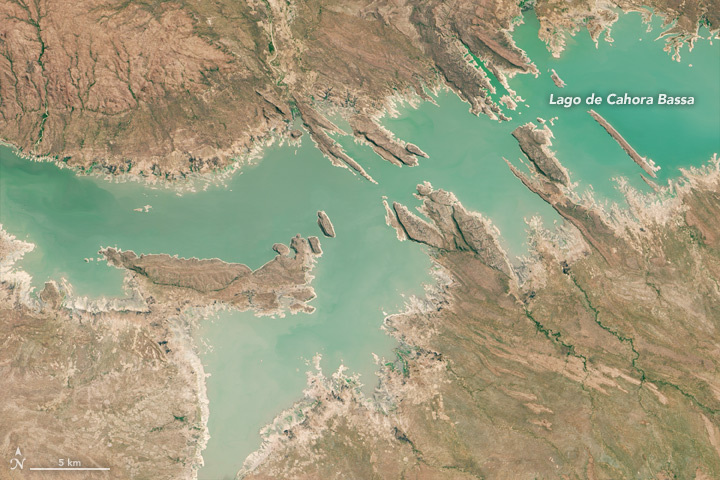 Images from the Operational Land Imager (OLI) on Landsat 8 satellite show water levels dropping in the Lago de Cahora Bassa between July 2014 and August 2016. The lake is part of the Zambezi River Basin, which also supplies water to Zimbabwe and Zambia. Water levels on Lago de Cahora Bassa have dropped more than than five meters below capacity. 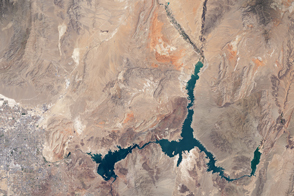 The light-colored “bathtub ring” around the reservoir’s shores and islands in 2016 indicates exposed sediments that were underwater in 2014 before the water receded. Pronounced changes in water depth also show up in the lake’s color, with deep, emerald shades turning milkier as the reservoir empties. 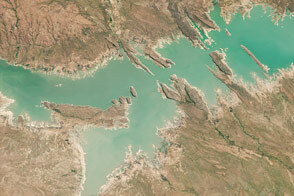 Some features have emerged from the lake as water levels has receded; in the second image, a former island has filled out into a peninsula. There is no bathtub ring visible around Lake Kariba (to the west) because the lake is much narrower and deeper. But that reservoir now stands just 31 percent full. 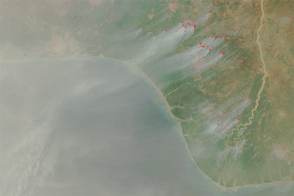 The Moderate Resolution Imaging Spectroradiometer (MODIS) on NASA’s Aqua satellite captured a wide view (below) of Kariba and Cahora Bassa on August 1, 2016. 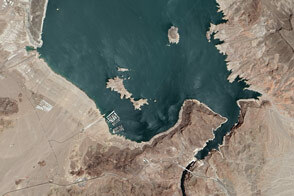 Both reservoirs are home to massive hydropower dams that supply the region with electricity. While the power plant on Cahora Bassa is not in imminent danger of shutting down, its operator has announced it will reduce energy production following below-average rainfall in 2016. The decision comes after Cahora Bassa Hydroelectric saw its highest recorded output in 2015—more than 16,000 gigawatt hours. Even as the waters recede in 2016, demand for electricity remains high. Projects to expand the Cahora Bassa dam and the connecting electric grid continue because they play an important role in the nation’s economy. Mozambique exports nearly three-fourths of the dam’s energy to South Africa. 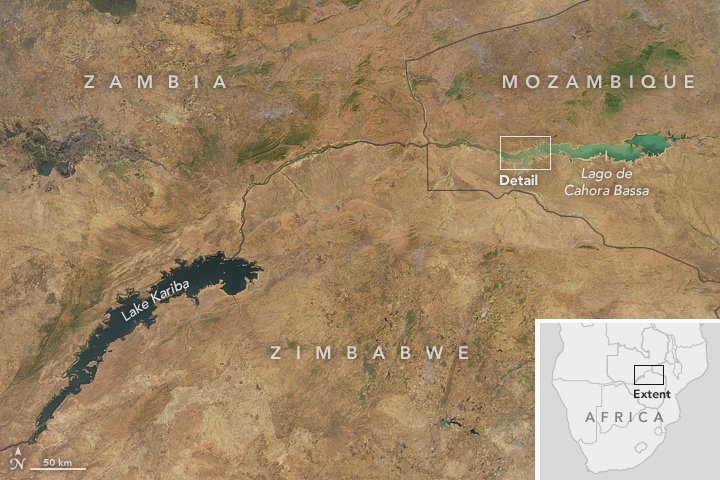 Further upstream, Zambia’s Lake Kariba dam generated just 25 percent of its energy production capacity in April 2016, The New York Times reported. 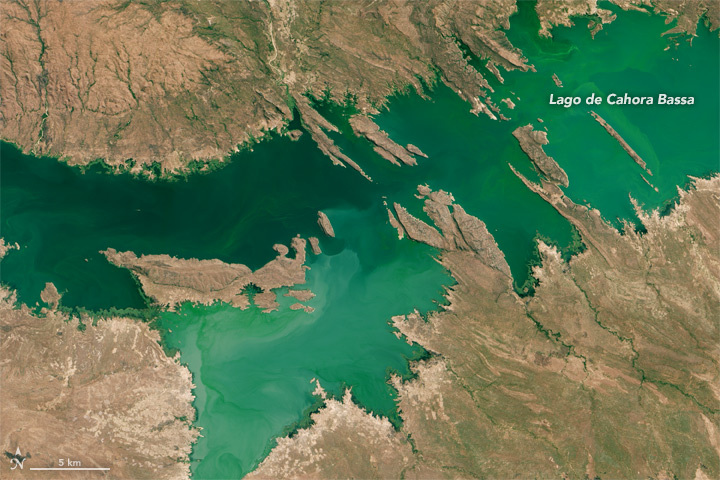 The lake reached critical lows in February 2016. Researchers predict that the flow of the Zambezi River, which supplies both man-made lakes, will decrease by 40 percent or more as climate changes, according to a recent IPCC report. 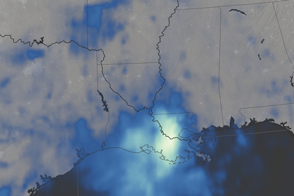 They expect precipitation to fall by roughly 15 percent, while evaporative losses could rise by 15 to 25 percent, and runoff could fall by about 30 to 40 percent. 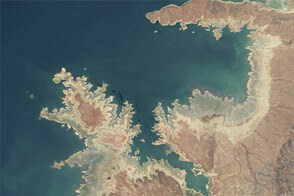 NASA Earth Observatory image by Jesse Allen, using MODIS data from the Land Atmosphere Near real-time Capability for EOS (LANCE) and Landsat data from the U.S. Geological Survey. Caption by Pola Lem. Low water levels on this Mozambique reservoir betrayed signs of drought stress in August 2016. Bola, G., et al. (2013) Coping with Droughts and Floods: A Case Study of Kanyemba, Mbire District, Zimbabwe. Physics and Chemistry of the Earth. Volume 67, p. 180-186. Intergovernmental Panel on Climate Change Working Group II: Impacts, Adaptation, and Vulnerability. Accessed July 28, 2016.
International Hydropower Association (2016) Hydropower Status Report 2016. Accessed August 15, 2016. The Guardian (July 25, 2016) U.S. Gives $127M to Africa. Accessed July 28, 2016. 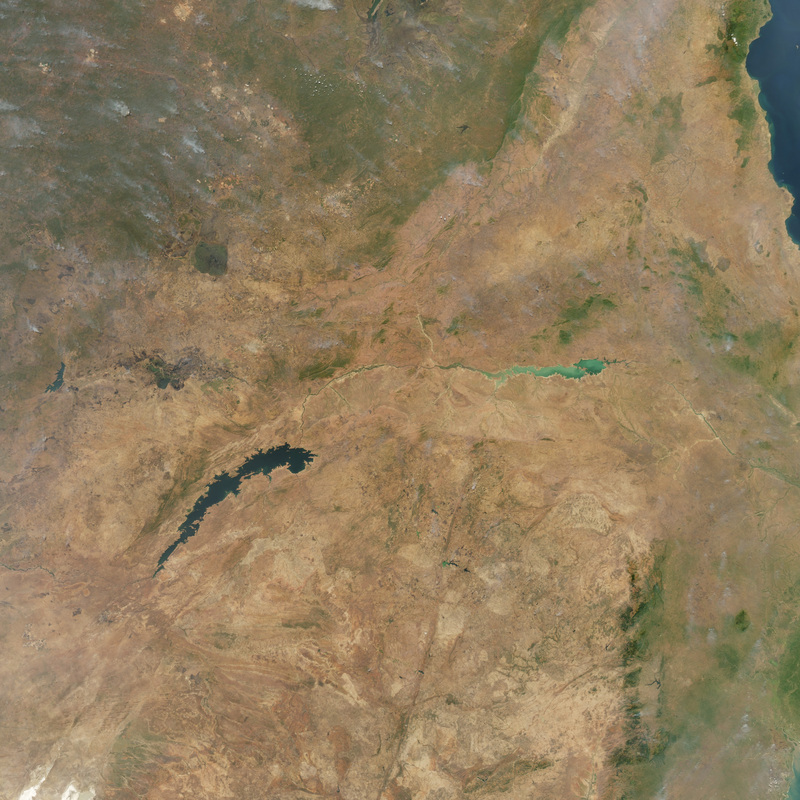 NASA Earth Observatory (2011, June 30) Severe Drought Causes Famine in East Africa. Accessed July 28, 2016. NASA Earth Observatory (2013, December 12) Zambezi River Delta. Accessed August 8, 2016. Reuters (2011, July 26) Millions Need Aid as Zimbabwe Battles Drought. Accessed August 8, 2016.